Inspired by History: Owen Jones and the Grammar of Ornament | John Canning & Co.
Owen Jones’ Proposition I has always been a guiding principle for our studio, even today. “The decorative arts arise from and should properly be attendant upon architecture”. We are reminded of this daily in nature, in our projects, and in our designs. 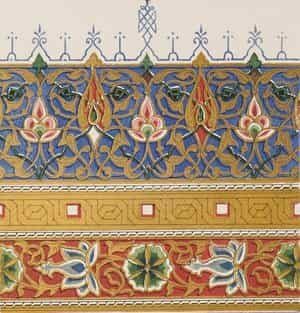 Jones writes “Man’s earliest ambition is to create,” and we often reflect on this statement and his 37 Propositions and how, even after 150 years, Jones’ Grammar of Ornament remains one of the most influential decorative ornament books. Jones, trained as an architect and designer, is known for his studies on colour theory and geometry. Also an educator, he gave various lectures and articles on his theories for decorative design. His work was inspired by various cultures visited during a Grand Tour at the age of 23. He visited countries such as Italy, Greece, Egypt, Turkey, and Spain, spending a significant amount of time studying the Alhambra. Most notably, Jones was Superintendent of Works for the 1851 Great Exhibition and was responsible for the interior decoration and the layout of the Crystal Palace. 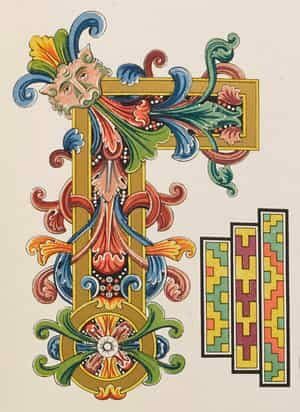 Jones created the Grammar of Ornament to speak to young designers and craftsmen and remind them to look to history for the foundations of good design. Originally published in 1856. The Grammar of Ornament is a summary of his theories. These basic principles are a kind of preface to the book. A collection of ornament and decoration, the Grammar of Ornament was produced on 600 hand-etched stone plates and took over five people a year to create. Christopher Dresser, a designer and design theorist and one of Jones’ proteges, also produced original drawings and plates for the book. 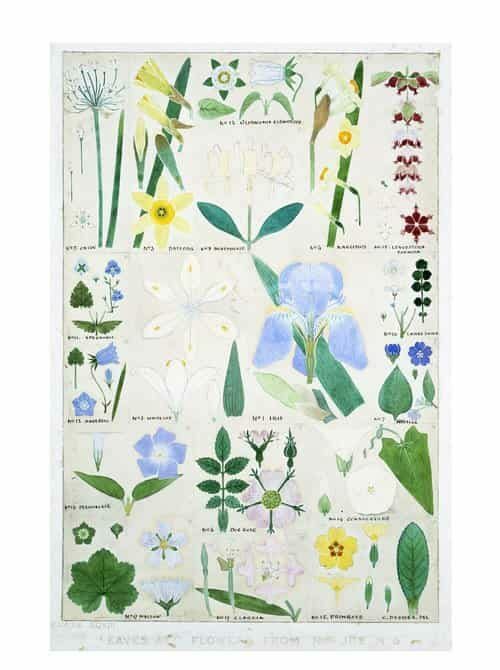 Illustrated with 112 oversize plates, with samples of ornamental design from all over the world, this is a stunning reference book on pattern that continues to fascinate 150 years on. General principles in the arrangement of form and colour, in architecture and the decorative arts, which are advocated throughout this work. The Decorative Arts arise from, and should properly be attendant upon, Architecture. Architecture is the material expression of the wants, the faculties, and the sentiments, of the age in which it is created. Style in Architecture is the peculiar form that expression takes under the influence of climate and materials at command. As Architecture, so all works of the Decorative Arts, should possess fitness, proportion, harmony, the result of all which is repose. True beauty result from that repose which the mind feels when the eye, the intellect, and the affections, are satisfied from the absence of any want. Construction should be decorated. Decoration should never be purposely constructed. That which is beautiful is true; that which is true must be beautiful. Beauty of form is produced by lines growing out of one from the other in gradual undulations: there are no excrescences; nothing could be removed and leave the design equally good or better. The general forms being first cared for, these should be subdivided and ornamented by general lines; the interstices may then be filled in with ornament, which may again be subdivided and enriched for closer inspection. All ornament should be based upon a geometrical construction. As in every perfect work of Architecture a true proportion will be found to reign between all the members which compose it, so throughout the Decorative Arts every assemblage of forms should be arranged on certain definite proportions; the whole and each particular member should be a multiple of some simple unit. Those proportions will be the most beautiful which it will be most difficult for the eye to detect. Thus the proportion of a double square, or 4 to 8, will be less beautiful than the more subtle ratio of 5 to 8; 3 to 6, than 3 to 7; 3 to 9, than 3 to 8; 3 to 4, than 3 to 5. Harmony of form consists in the proper balancing, and contrast of, the straight, the inclined, and the curved. In surface decoration all lines should flow out of a parent stem. Every ornament, however distant, should be traced to its branch and root. Oriental practice. All junctions of curved lines with curved or of curved lines with straight should be tangential to each other. Natural law. Oriental practice in accordance with it. 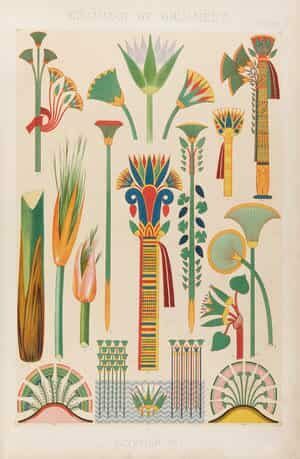 Flowers or other natural objects should not be used as ornaments, but conventional representations founded upon them sufficiently suggestive to convey the intended image to the mind, without destroying the unity of the object they are employed to decorate. Universally obeyed in the best periods of Art, equally violated when art declines. Colour is used to assist in the development of form, and to distinguish objects or parts of objects one from another. Colour is used to assist light and shade, helping the undulations of form by the proper distribution of the several colours. These objects are best attained by the use of the primary colours on small surfaces and in small quantities, balanced and supported by the secondary and tertiary colours on the larger masses. The primary colours should be used on the upper portions of objects, the secondary and tertiary on the lower. (Field’s Chromatic equivalents.) The primaries of equal intensities will harmonise or neutralise each other, in the proportions of 3 yellow, 5 red, and 8 blue, - integrally as 16. The secondaries in the proportions of 8 orange, 13 purple, 11 green, - integrally as 32. The tertiaries, citrine (compound of orange and green), 19; russet (orange and purple), 21; olive (green and purple), 24; - integrally as 64. Each secondary being a compound of two primaries is neutralised by the remaining primary in the same proportions: thus, 8 of orange by 8 of blue, 11 of green by five of red, 13 of purple by 3 of yellow. Each tertiary being a binary compound of two secondaries, is neutralized by the remaining secondary; as, 24 of olive by 8 of orange, 21 of russet by 11 of green, 19 of citrine by 13 of purple. The above supposes the colours to be used in their prismatic intensities, but each colour has a variety of tones when mixed with white, or of shadeswhen mixed with grey or black. When a full colour is contrasted with another of a lower tone, the volume of the latter must be proportionally increased. Each colour has a variety of hues, obtained by admixture with other colours, in addition to white, grey, or black: thus we have of yellow, - orange-yellow on the one side, and lemon-yellow on the other; so of red, - scarlet-red, and crimson-red; and of each every variety of tone and shade. When a primary tinged with another primary is contrasted with a secondary, the secondary must have a hue of the third primary. In using the primary colours on moulded surfaces, we should place blue, which retires, on the concave surfaces; yellow, which advances, on the convex; and red, the intermediate colour, on the undersides; separating the colours by white on the vertical planes. When the proportions required by Proposition 18 cannot be obtained, we may procure the balance by a change in the colours themselves: thus, if the surfaces to be coloured should give too much yellow, we should make the red more crimson and the blue more purple, - i.e. we should take the yellow out of them; so if the surfaces should give too much blue, we should make the yellow more orange and the red more scarlet. The various colours should be so blended that the object coloured, when viewed at a distance, should present a neutralized bloom. No composition can ever be perfect in which any one of the tree primary colours is wanting, either in its natural state or in combination. When two tones of the same colour are juxtaposed, the light colour will appear lighter, and the dark colour darker. When two different colours are juxtaposed, they receive a double modification; first, as to their tone (the light colour appearing lighter, and the dark colour appearing darker); secondly, as to their hue, each will become tinged with the complementary colour of the other. Colours on white grounds appear darker; on black grounds lighter. Black grounds suffer when opposed to colours which give a luminous complementary. Colours should never be allowed to impinge upon each other. When ornaments in a colour are on a ground of a contrasting colour, the ornament should be separated from the ground by an edging of lighter colour; as a red flower on a green ground should have and edging of lighter red. When ornaments in a colour are on a gold ground, the ornaments should be separated from the ground by an edging of a darker colour. Gold ornaments on any coloured ground should be outlined with black. Ornaments of any colour may be separated from grounds of any other colour by edgings of white, gold, or black. Ornaments in any colour, or in gold, may be used on white or black grounds, without outline or edging. In “self-tints”, tones, or shades of the same colour, a light tint on a dark ground may be used without outline; but a dark ornament on a light ground requires to be outlined with a still darker tint. Imitations, such as the graining of woods, and of the various coloured marbles, allowable only, when the employment of the thing imitated would not have been inconsistent. The principles discoverable in the works of the past belong to us; not so the results. It is taking the end for the means. No improvement can take place in the Art of the present generation until all classes, Artists, Manufacturers, and the Public, are better educated in Art, and the existence of general principles is more fully recognized.